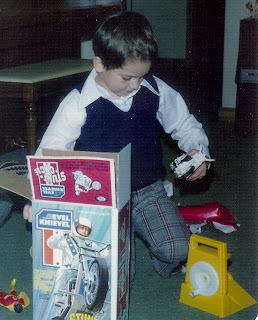 43 years after his father's failed stunt, Evel Knievel's son Robbie is going to try to jump Snake River Canyon in 2011. Did you tune in to see Evel back in 1974, when he strapped himself into his rocket-powered "Sky-Cycle" and attempted to shoot across the quarter-mile-wide Idaho canyon? I did -- to a six-year-old kid, is there anything better than watching a jumpsuited daredevil shoot across the sky in a rocket? Um, nope. After a bone-crunching wipeout, you could dust off Evel’s tiny doppelganger, bend his twisted limbs back into shape, jam him back on the cycle and force him to do it all again without so much as an St. Joseph’s chewable aspirin to dull the pain. Hope Robbie did a lot of practicing with that thing. Here's video of Evel's big jump.